Up until now I've only reviewed horror movies… not that this site has been around for very long. But horror isn't just limited to movies. Television series' like The Strain and American Horror Story (among so many other greats) are giving horror fans reason to tune in weekly or in the case of Netflix, binge an entire season over the course of a weekend. Speaking of Netflix, one of their originals that doesn't necessarily market itself as horror programming is the popular Black Mirror. The show is billed as a science fiction anthology that considers potential consequences of emerging technologies. Thing is, there were a number of episodes that legit scared the crap out of me. Episodes like USS Callister (S4, E1) and Nosedive (S3, E1) are scary stories to consider in regards to where technology is taking us, though fall firmly in the realm of sci-fi. But you can make the argument that Playtest (S3, E2) can be considered horror - if not at least horror-adjacent. To start my evening off, I reached for some Fire OG. This would be my first time to be taken over by the FOG and after hearing such great things about it, I was excited to give it a go. The moment I popped open the cap, a strong aroma came bursting out and immediately brought a smile to my face before even taking my first hit. The smell is tastefully dank with a strong scent of astringent citrus. Fire OG is an indica that's crossed between the legendary OG Kush and SFV OG Kush. It didn't take long after pulling those cannabinoids deep into my lungs before the effect took hold. By the time I pressed play and began watching the episode, I was already high as a kite. Unlike other indicas, Fire OG didn't immediately put me into a relaxed dreamlike state. I didn't feel tired at all. Instead I felt awake, energized and almost like I should be doing something more productive than sitting down to watch television. But sit I did - and I'm glad. More on that later. 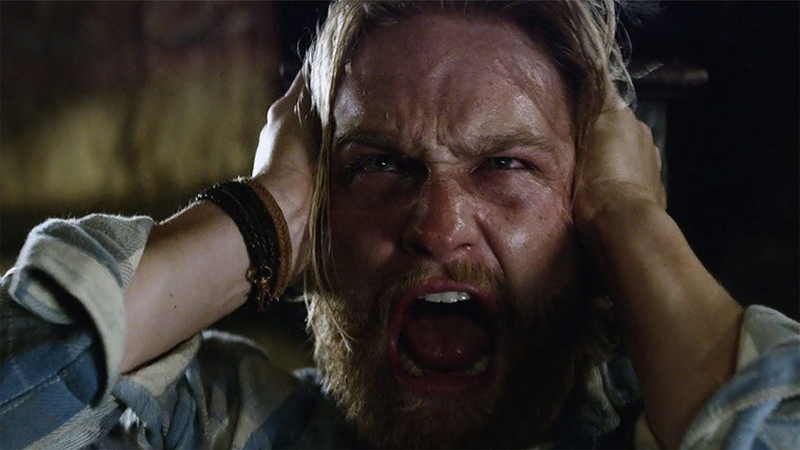 Directed by Dan Trachtenberg (10 Cloverfield Lane), Playtest begins by introducing us to the story's protagonist Cooper, played by Wyatt Russell. Cooper is an American (with some deep family issues) who's decided to leave home and travel the world. Arriving in London, he shacks up with Sonja (Hannah John-Kamen), a girl who has a passion for video games. Things ratchet up once Cooper gets an opportunity to playtest a new game developed by celebrated Japanese designer Saito (Ken Yamamura). Saito is an obvious nod to Kojima, creator the Metal Gear Solid franchise. Once Cooper takes Sonja's advice to take the playtest gig, it's off to the races. Once 'jacked in', he's assured that nothing in the virtual world can hurt him or cause any harm. Being a gamer myself, it was satisfying to see so many nods and references to video game culture scattered throughout. From the main set piece that looks striking similar to the Resident Evil mansion, and a Bioshock "would you kindly" quote, to Coopers last name (which I won't spoil) that's revealed at the end of the episode. I'm also a strong advocate and believer of virtual (VR) and augmented reality (AR). So when Cooper arrives at Saito Games and is shown a demo of some new augmented reality tech, I was instantly invested. It's also at the game studio where we're introduced to the playtest guide, Katie (Wunmi Mosaku). She starts the playtest session by introducing Cooper to a cute whack-a-mole game that quickly demonstrates how realistic the AR images can be. From there Cooper is taken to meet Saito himself. Once "jacked in", he's assured that nothing in the virtual world can hurt him or cause any harm. But that doesn't make things any less terrifying. Cooper is placed into a mansion without any direction and left to explore. The mansion itself is beautiful and perfectly captures the ambiance of a survival horror game. It's also around this time that my good friend Fire OG started creeping into its second stage - deep couchlock. Thank goodness I didn't entertain my earlier idea of starting something productive. The only thing I was qualified to do at this point was become one with my mattress and hypnotically connect my eyes to my television. I literally tried to (unsuccessfully, mind you) convince my brain to move my arms into a more comfortable position. Nope. Not gonna happen. The "game" starts off scary, but tame - an augmented spider, weird sounds and shadows, a creepy old gravekeeper looking guy. Cooper takes it in stride knowing that nothing can hurt or cause him harm. But then the images become even more nightmarish and Cooper finds himself stuck in a reality he can't escape. I also felt myself stuck and unable to look away as my heart raced faster and faster. The weed was definitely affecting my brain and increased the sense of terror I was feeling. Without giving away any major plot twists, Playtest is a visceral look at how mind-bending AR can become and how under extreme circumstances a user would not be able to distinguish what's real and what's augmented. 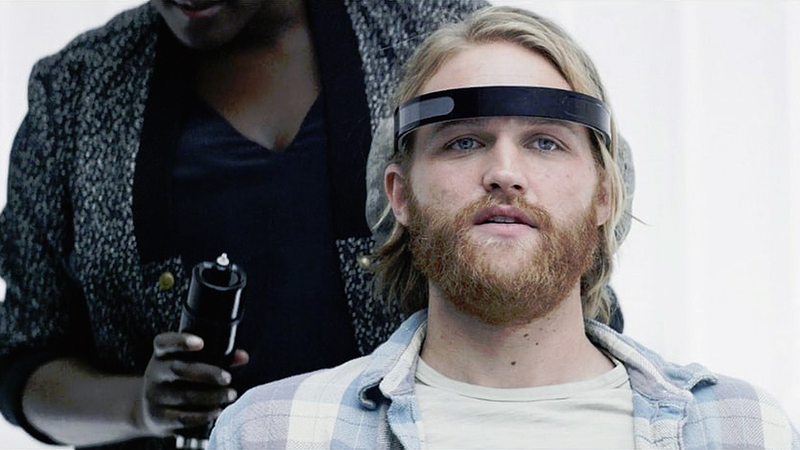 Today's AR tech is obviously nowhere near the level of what's on display here, but that's the trademark of Black Mirror. It's food for thought. I absolutely loved this episode. It's one of my favorite Black Mirror episodes so far. Maybe it's because I'm a gamer. Maybe it's because I'm fascinated with VR/AR technology. Maybe it's because I was high AF. But I don't think so. Yes, those details added to my enjoyment. But I think anyone would find this story entertaining. How about you? Are you a fan of Black Mirror? Have you watched this episode or tried Fire OG? I'd love to hear your thoughts in the comments below. Last but not least, please don't forget to follow Bloody High on Instagram, Twitter and Facebook.